In much of the world, people want to smell as good as they look. This often means we use deodorant to smell better and an antiperspirant to control sweating. Many of these antiperspirants contain aluminum as one of the main ingredients. However, studies have been done that show that prolonged exposure to aluminum may not be healthy. Fortunately, you do have some options if you do not want prolonged exposure to aluminum. There are some commercially prepared options and a couple of recipes for homemade deodorants. Deodorants without aluminum are not antiperspirants. The good news is that sweat only smells bad when bacteria release toxins. Deodorants without aluminum can kill the bacteria that cause the odor. Typically, a deodorant without aluminum will contain oils or plant extracts to kill the bacteria and provide a fresh scent. Available in three scents (sage, wild rose and lemon), Weleda is an organic non-aerosol deodorant that contain no aluminum. Instead, these compounds are made up of essential oils. The sage smell is great for men, the wild rose for women, and the lemon for anyone. 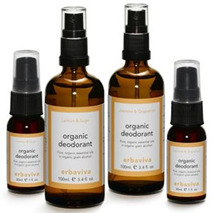 Erbaviva is another non-aerosol deodorant spray that comes in two different scents. The lemon scent contains lemon, tea tree, patchouli and sandalwood oils. The jasmine grapefruit scent contains jasmine, grapefruit, lemon, cedar, and ginger oils. Be aware that these sprays both contain alcohol to help kill the bacteria on the skin. This roll on Deodorant Fresh is scented with lemon oil and uses sage and witch hazel to kill odor causing underarm bacteria. These deodorants are especially formulated for people with skin that is sensitive to chemicals. Tom’s of Maine stick deodorant has been around for many years. Available as original, sensitive, or long-lasting, this deodorant gets its bacteria fighting ability from hops! If you are interested in being environmentally friendly when buying deodorant without aluminum, you should be aware that Tom’s donates 10% of their profits to human and environmental concerns. You may find that none of the commercially available deodorants without aluminum work for you. In that case, try making a homemade recipe! Here are two recipes that you can make for yourself at home – and neither one contains aluminum. A very simple deodorant made out of 3 ingredients may be a great deodorant for you. Mix the dry ingredients in a bowl. Add the coconut oil and mix it well. Put the mixture into a glass container. Note that the mixture may harden in cooler temperatures. To make it easier to apply, warm the bottle of deodorant under hot running water before applying. Another homemade deodorant is one made with body butters and essential oils. Warm the Shea and cocoa butters so they are soft. Mix in the baking soda and cornstarch (or arrowroot powder). Stir the mixture well and then add the essential oil of your choice. Put it in a glass bottle and use it every day! Aluminum in deodorants builds up on the skin causing the pores and sweat glands to become blocked. By blocking the sweat glands, aluminum prevents the underarms from sweating. This blockage may also result in the accumulation of toxins in the sweat glands. Ultimately, the lymph system will pull the toxins out of the glands and move them around the body potentially depositing them in your liver, kidneys and other organs. Aluminum is one of the metals that has been associated with the development of Alzheimer’s disease and some forms of cancer.